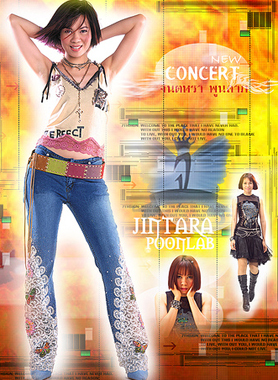 Jintara Poonlarp is a Thai mor lam (Thai country) , luk thung (Thai pop-country) and pop music singer. She released 40 original albums as well as many compilations. She records roughly equal amounts of mor lam and luk thung, but two of her best-known songs are the string (Thai pop) hits "Ma Tammai" and "Faen Ja," recorded with Bird McIntyre. She is also sometimes known by her nickname Jin or the epithet sao siang pin (meaning "lute-voiced girl"). Born in Thailand's Isan region, Jintara's birth name was Tongbai Janlueang but this changed to Tongbai Poonlarp when her parents registered their marriage. Jintara is her stage name. She began performing in her early teens. She made 20 audio-only recordings for GMM Grammy and later a further five for the Master Tape record label. She has since made a further series of recordings for Master Tape, variously entitled Luk tung sa on and Mor lam sa on, each on VCD, CD and audio tape formats ("sa on" in the Isan language meaning roughly "enjoyable"). A number of greatest hits collections have also been issued, some of which contain videos of songs from the first audio-only series. Her first five albums included only luk thung, but since then most have combined luk thung, mor lam and sometimes string (Thai pop). Her most famous string songs are "Ma Tammai" and "Faen Ja," both in collaboration with Bird McIntyre. She tours with a live show from September to May each year and has made several appearances in Europe and North America. Jintara on the cover of her Mor lam sa on 8 album, which imitates Beyoncé's cover for Dangerously in Love. Jintara has a distinctively rough-edged voice. Her music is strongly pop-influenced, with western instruments dominant. Her image also tends to the contemporary and Western: In most of her videos both she and her dancers wear modern dress, and one album cover, Mor lam sa on 8, was an imitation of Beyoncé's Dangerously in Love. Among her best-known songs is "Sao Isan plat tin" ("Isan girl poor and far from home," album 9), which incorporates the typical Thai country themes of poverty, homesickness and an unfaithful lover. "Arlai World Trade" ("Mourning the World Trade Center," album Luk tung sa on 6) aroused comment in Thailand's English-language press for the way it addressed the September 11, 2001 attacks: "the reigning Morlam superstar of Thailand laments the attacks of Sept. 11 while young, bare-midriffed Thai girls gyrate in front of a surging American flag". In 2003, the Thai Ministry of Culture proposed banning one of her songs, "Tears of a Lieutenant's Wife" ("Namta mia nairoi") on state-run media. In 2004 she began studying for a degree in political science at Rajabhat Institute Suan Sunandha, Bangkok, from which she is due to graduate in 2006. Newspaper reports suggested that she was considering standing as an MP for the Chart Thai (Thai Nation) party, but would not be able to do so until she had graduated; she did not stand in the 2005 election. She was awarded an honorary degree by the Rajabhat Institute of Roi Et in October 2004. As of February 2006 she had released 38 original albums plus numerous compilations. In 2001 she played her first role television role in the series Nai Hoy Tamin, about the life of rural people in Isan in historical times. She co-starred in the 2006 action film, Chai Lai (Dangerous Flowers), portraying a member of a top-secret team of female crimefighters.